Saturday was a beautiful morning in the small hamlet of Lincoln, NH. The sun was rising brightly over the eastern mountains, the temperature cool and crisp, more akin to an October morning than August. Unlike every day that I have to get to work, I was up with my alarm though moving with my usual morning sluggishness. I’m just not a morning person. Never have been, never will be. I love being up early, I just hate GETTING UP early. Making sure all my gear was ready to go, having staged it all the night before, I went down to the typical hotel “Continental” breakfast and fed myself on yogurt, peanut butter and jelly toast and some coffee. It was a very short drive up to Loon Mountain Resort and the starting line. I’d managed to time it all perfectly so as not to be rushed at all but arriving at the start with just about 10 minutes to wait for gun. Or in this case, the cannon. Time enough to take a quick photo, a bit of stretching and decide that at 55 degrees, it was still cool enough to keep my armwarmers on. If you looked at the graphic from my last post you may have noticed that the Gran Fondo, Medio (medium) and Piccolo (short) all started at different points along the route and so, it was only us long riders at the start here on the mountain. I was a bit surprised how small the group was. I would have said from a glance around, less than 100. As I found out later in the results, it was actually 197. Not quite the massive throng I’d experienced at the Gran Fondo NY, with 6000 of us jammed on the George Washington Bridge. It was kind of cool to be right up there, within 20 or so riders of the actual start line when that cannon went off. WELL, I’m awake now. And we were off. Nothing like starting with a 10.8 mile climb. The good news there is that it was a very gradual climb for the first several miles, a decent chance for the legs to get warmed up, which always takes me much longer, in both distance and time, than it does for nearly every one of my riding friends back home. I was in no rush, and adamant about riding my own “race” so it was not a surprise for me that I was passed by nearly everyone. I knew for sure that once I got myself going, later in the day, I’d be seeing many of these riders again as I passed them back. And I did. I won’t bore you with the details of 7 hours and 103 miles of ride. I had a great day of riding. My legs hit their stride after about an hour, which is typical. The roads and scenery were wonderful, with challenging, but not spirit shattering climbs, sweet, swifty descents, and lots of nice and surprisingly flat riding in between. I stopped at each of the 3 fully stocked reststops for food, water refills and a short break. There were 3 other water-only stops in between, but the distances were planned out perfectly and I did not have need to stop at those. The forecast had called for a good chance of afternoon showers, but the weather held out beautifully. We probably topped out in the mid 70’s, with only some light wind. A perfect day for riding. Afterwards, as planned, I drove back down to spend the night in Manchester. Dinner at Cotton was exceptional, thanks in part to having my OpenTable.com reservation. The restaurant was packed; clearly a well known and local favorite that I would definitely recommend. 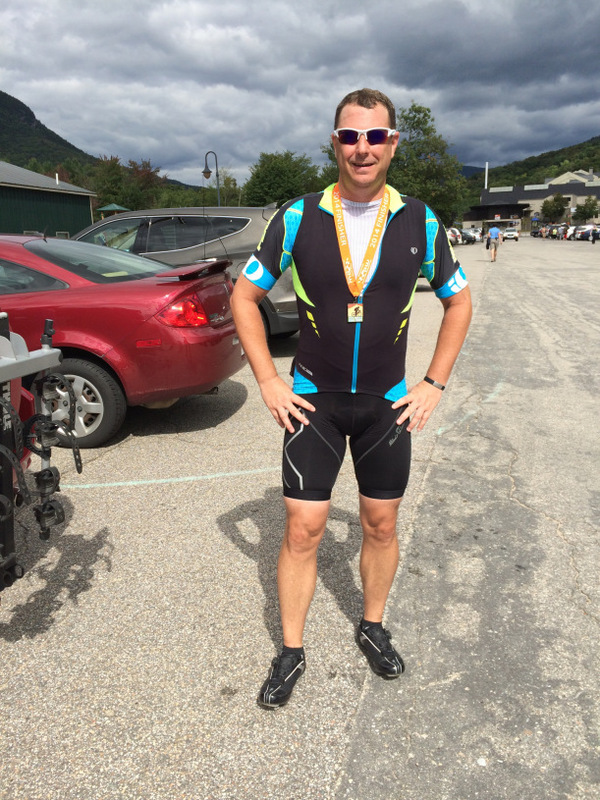 Gran Fondo White Mountains is a terrific ride. Although much of the roads are main thoroughfares through the White Mountains National Forest, where the traffic areas were heavier, the shoulders were wide. There were some backroads to enjoy as well and the entire event was well organized, easy to travel to and a really fun time. It gets a thumbs up on my reputation scale. This entry was posted in Uncategorized on October 21, 2014 by PR-Bike. Hi there! I enjoyed reading your blog post and was hoping to ask you a question via email. Would you mind sending me a note at the email address I provided? Thank you!